Read here about a simple tensegrity structure named the "X Tensegrity." Connelly cites Snelson's X Tensegrity as the simplest tensegrity. He also classifies it as super-stable. An illustration showing Kenneth Snelson's X-Module design of 1948 as embodied in a two-module column. It only shows the design as pertains to tensegrity, and does not duplicate the original art work. The simple kite frame, two crossed struts held firmly together by a girth of four tension members, is a human invention and probably thousands of years old. Long before people covered it with paper for use as a flying object to loft in the wind the frame most likely was used as a lightweight pallet, a stretcher for transporting things. Basic as it is, the prestressed kite exits only in the world of people; not as a product of nature. The kite frame can be built in many proportions as shown below. The structural principle remains the same except that the distribution of forces, both tension and compression, vary as the proportions are altered. Always, though, the total of the compression forces pushing out are equal to the sum of the tension forces pulling in. 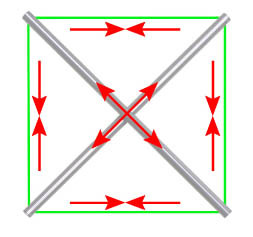 The kite frame is quasi-tensegrity because the two struts, lacking a force in the "z" direction in order to separate, touch and press on one another where they cross. The kite structure is the basic prestressed tension-compression cell for x-module tensegrity structures. The lengths of the four tendons and the lengths of the struts determine the shape. 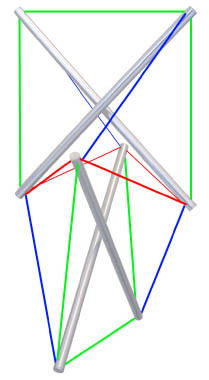 The kite frame is transformed into a true tensegrity structure by introducing a third strut which is done by replacing one of the original "edge" tension lines (in green) with four new lines shown in red. These four perform as "slings" which suspend the new strut. The three-strut structure must now be made stable by adding two additional lines (draws), those shown in blue. The "draw" tendons go from the ends of the new, third, strut to the far ends of the original pair; to those ends that will draw the kite struts away from one another. Connected to the wrong two ends the draw lines will only force the kite struts into firmer contact and fail to achieve a floating compression structure. It is essential in this simple structure, as in all tensegrity structures, to establish the optimum lengths for the tension members so that the work will be firm and tightly prestressed. This can only be done by successive adjustments, by trial and error. If the length of one line is changed the tension on all lines are effected. As a general rule the draw lines are the primary means for increasing or relaxing the prestressing of a tensegrity structure. As with most rules, there are a variety of exceptions. This construction process, adding parts one by one, has now ransformed the basic kite frame into a proper three-strut tensegrity module.. It is structurally the same as the three-way module shown on page 15. Only their shapes and symmetries are altered by size adjustments of the tendons and struts. 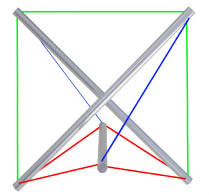 In the figure to the right, the third strut that was introduced in the figure above is itself replaced by a second kite frame; "slings" in red, "draws" in blue. This new assembly of two "x-modules" represents the first step in a construction process -- adding module after module -- that can be expanded indefinitely. Each open quadrant of any module offers a place to connect yet another x-module. Konstantin uses the X tensegrity method in his furniture and sculpture. X-tree sculpture by Konstantin, steel and wire rope. This page was last edited on 24 November 2018, at 18:01.